The Boy's Own Story was Peter Flannery's first full length play produced at the Contact Theatre, Manchester in 1978. 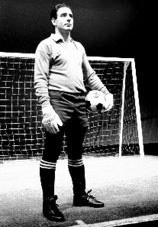 An updated version was produced in 1991 with Guy Masterson playing the goalkeeper. The stage featured a large Astroturf six-yard box goalmouth and a full size goal complete with net. The play opened revealing a goalkeeper on the field of play aparently in the midst of a eventless sunday league soccer match... one in which the goalie never seems to get the ball. While keeping an eye on the game before him, his boredom with his inaction prompts him to speak with his audience who are apparently situated in the penalty area. He begins to tell them his life story. It is a bittersweet tale of a fostered lad, moved from home to home, bullied for his shyness, but who discovers an amazing talent for goalkeeping... one that gives him superficial popularity and eventually takes him to the very top of the domestic professional game to become "The best goalkeeper never to play for England!". Yet his inability to handle the limelight and his social ineptitude keep him fundamentally unpopular and lonely. The monologue furnishes an anatomy of acute individuality and lonliness using the parallel of the goalkeeper - being the only different one in a team of footballers... "Their job is to score goals, mine is to stop 'em... I'm here to spoil their game." and how these traits manifest themselves in his life. This universal theme highlights the desire in everyone to dare to be different but also the dangers of actually being "different" in an intolerant society. Towards the end of the 90 minutes, the audience realises that this is perhaps his last game, because even here, he's not really wanted either. The Boy's Own Story played over 200 times domestically. It was particularly popular in schools both because of its theme but also its theatrical use of Soccer as an attraction to the theatre for younger people. It eventually played for a month in London at the Chelsea Centre Theatre to critical acclaim and 3 London Fringe Award Nominations. The boots were hung up after Guy Masterson secured a nine month run in the West End with Robert Lindsay's Cyrano de Bergerac.